In the module following this one, we will actually create the course project database that we discussed earlier in the course. If you are running Oracle, you'll be building an actual database, and if you are not running Oracle, we'll walk you through the steps so you know how to do it. In addition to being used for this course, this project database will also be used for the next four courses in the Oracle Database Administration Certification Series. Now, let us make the necessary preparations to create a database. Before you install Oracle and start creating databases, you must understand Oracle's Optimal Flexible Architecture (OFA) standard. This standard is widely employed for specifying consistent directory structures and the file-naming conventions used when installing and creating Oracle databases. Note One irony of this ubiquitous OFA "standard" is that almost every DBA, in some manner, customizes it to fit the unique requirements of his or her environment. Because most shops implement a form of the OFA standard, understanding this structure is critical. Figure 6-1 shows the directory structure and file names used with the OFA standard. 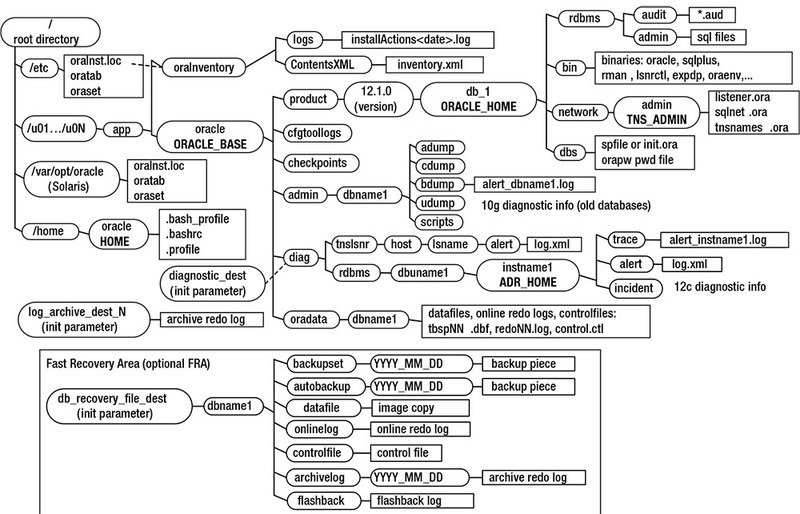 Not all the directories and files found in an Oracle environment appear in this figure (there is not enough room). However, the critical and most frequently used directories and files are displayed. These directories are discussed in the following sections.